Irwin “Sonny” Fox recalls his small role in bridging the political divide between nations. 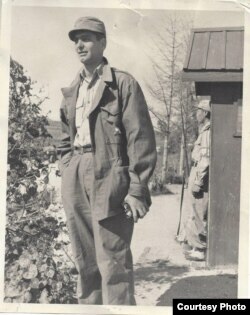 He was on the front lines of the Korea conflict in 1953, working as a correspondent for the Voice of America. The troop contingent from Greece was preparing to celebrate Greek Independence Day, which commemorates the 19th century Greek war of independence against the Turkish Ottoman empire. Fox had an idea for a story. He suggested that the commander of the Greek battalion invite the general staff of the Turkish brigade to the celebration. The commander reluctantly agreed, and surprisingly, the Turkish troops accepted. Fox recalls that it was a quiet day on the war front, and the Greeks were drinking ouzo, a traditional and very strong alcoholic drink. Fox's job was to cover troops of the 16 nations with fighting units in Korea, except for the largest contingent, the Americans. He says the American media was covering U.S. forces, while VOA's foreign language broadcasters sent news of the international troops to their home countries. During a break in the fighting, he recalls recording Belgian troops singing a French chorus of the Christmas carol "Silent Night." It would be part of the VOA holiday broadcast. When Fox complained that the background was too quiet for a front-line celebration, the troops rigged explosives on nearby hills to punctuate the chorus. Fox was given a rare opportunity to interview a defector from North Korea, who had flown his Soviet MiG fighter plane out of North Korea in September 1953 and was being held at a “safe” house in Okinawa. The defector's handlers from the Central Intelligence Agency trusted Fox to tell the story without revealing details of the operation or CIA involvement. Fox also would interview a Polish defector who was being held at the same Okinawa safe house. Fox has interviewed notable figures, including Eleanor Roosevelt, the widow of the late President Franklin D. Roosevelt, and the Indian diplomat Madame Vijaya Lakshmi Pandit. But his most memorable stories have been about ordinary people. One assignment helped him better understand the concerns of his international listeners. Fox was asked to follow a farmer from India who was touring the southern U.S. state of Georgia, under a program arranged by the New York Herald Tribune newspaper. Fox says the farmer was unimpressed with industrial-scale farming equipment, but was fascinated by a sharecropper with an ox-drawn wooden plow. Fox says it gave the visitor the idea of increasing the productivity of his one-hectare farm by sheathing his plow with steel. The early 1950s was the height of the Cold War, when the hunt for communists, spearheaded by Senator Joseph McCarthy, led to attacks on the State Department, at the time the parent agency of the Voice of America. Fox says VOA's New York offices housed an unofficial, self-described pro-American underground that searched the desks of colleagues for incriminating material. He says that at least one diplomat, a former VOA employee, was fired as the result of a letter found at the VOA office. But he remembers his years at the broadcast service as meaningful. Fox later would later work as a host on children's television in St. Louis and New York, as a game show host and network executive, but he relishes his years as an international broadcaster, when he says his work had an impact and made a difference.